These are two of the key fixed ingredients of an option – fixed, meaning they never change. They tell us what the option stands for and what it is worth. An option is a contract granting you as buyer control over 100 shares of stock. This is always the case – one option per 100 shares. The level of volatility in the underlying security. The greater the volatility, the higher the risk, and the higher the option's premium. Options are subject to exercise – remember that word? – meaning the owner has the right, at any time before expiration, to buy (through exercise of a call) or to sell 100 shares (through exercise of a put). This condition – with the call strike below current value of the underlying, or the put strike above – is referred to as in the money (ITM). For example, if a 35 call is valued at 5 ($500) and the current price per share of the underlying is $37, then the call is two points in the money (37 – 35). So the call has two points of intrinsic value (and three points are something else). For a put, the same rule applies – just in the opposite direction. Let's say a 40 put is valued at 3 ($300), and the current price per share is $42. The put is two points in the money, so there are two points of intrinsic value included in the premium. (The remaining point, again, is a different kind of value). Extrinsic value – also called an option's "implied volatility" – varies based on proximity, time, momentum in the underlying, and the underlying security's own volatility (its historical volatility). When expiration is a long way off, the overall option premium tends to be less responsive, even when in the money. Here's how that looks: If the option is in the money, the stock might make a three-point move, but the option premium might only move one point. In this situation, intrinsic value increases three points, but extrinsic value declines as an offset by two points. That's because expiration is a long way off, so there's more uncertainty about what the price might do. When the option strike is close to the underlying equity's current price, extrinsic value tends to be less of a factor (assuming there is no change in the underlying's volatility). So the price will be more likely to follow the point-for-point movement in the money. That's especially the case as we near expiration. The confusion between time and extrinsic value has led some analysts to assign characteristics to time value that are not accurate. All of the uncertainty in an option's current and future value is found in extrinsic value. Changes in value assigned to intrinsic and time value are well known and easily predicted. Excellent explanation of put and call options! 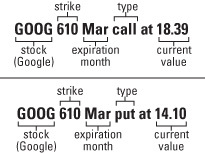 I did notice that under "How To Determine What Your Option Is Worth" (Intrinsic Value) that the examples used for the call and put are the same, that is, the underlying is higher than the strike price in both examples. I think the underlying should be less than the strike price in the put example, or the put should be considered OTM (out-of-the-money) if the underlying is higher than the strike price. What am I not getting here ? . . . In your put example, if a $40 put (ie, strike at $40) with an underlying at a current price of $42 . . . the put is OUT OF THE MONEY, is it not?? It would only be ITM if the underlying was below $40, true?? Was this an error, or what am I missing?? Mike is right. How can the writer of an article that is supposed to help others understand the 'simple' rules of options make so fundamental an error?